During the winter months my face becomes extremely dry and I break out in patchy eczema on my body. In a bid to combat both I recently purchased Barefoot Botanicals S.O.S Rescue Me Face & Body Cream. Barefoot Botanicals scores brownie points with me because the product range does not contain ingredients I like to avoid (e.g parabens, sls, petrochemicals), and it's suitable for vegans and cruelty free. The most exciting part is the S.O.S range is aimed at those prone to eczema and psoriasis. The S.O.S cream is rich, hydrating, easily absorbed and not greasy. I can apply make up over the top without any problems. I adore the smell, it is delicate from citrus. I use the cream morning and night and saw an improvement within the first few days. After a month of daily use my face was no longer flaky and I decided to stop using it and go back to my regular moisturiser. As well as treating my face I liberally applied to my eczema patches. I found the cream very soothing and calmed itching. My eczema did not disappeared but was more manageable and hydrated. Since my eczema does not cover a large area of my body a tube lasts me a bit longer by simply keeping it for those SOS moments. 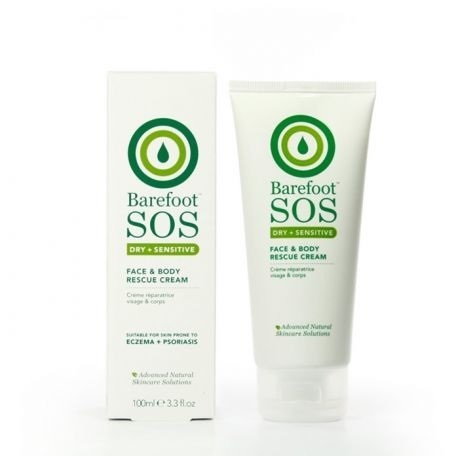 I recommend you take a look at the Barefoot Botanicals website as the S.O.S range also includes face wash, foot cream, hand cream, body lotion, shampoo and conditioner. There is also a helpful and informative "Skincare Clinic" section which covers a variety of topics including eczema.